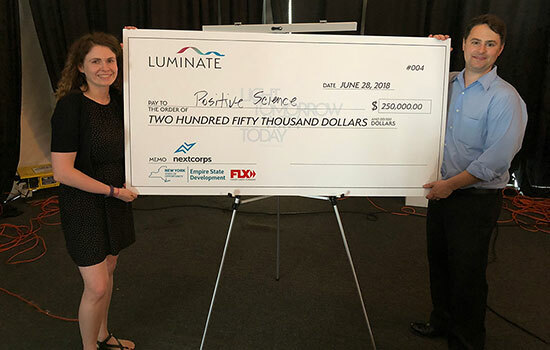 RIT alumnus Jason Babcock, right, founder and CEO of Venture Creations client company Positive Science, won $250,000 at the Luminate NY â€œLight Today with Tomorrowâ€ event June 28. Babcock is pictured with his wife, Jillian. Molecular Glasses, another Venture Creations company that focuses on technology that converts materials to noncrystallizable and soluble molecular glasses, took home the Audience Choice Award and $10,000. Two client companies in Rochester Institute of Technology’s Venture Creations incubator have won recognition and prize money from the New York state-funded Luminate NY accelerator program. Positive Science won third place in the competition and $250,000, and Molecular Glasses won $10,000 and the Audience Choice Award during the Luminate NY “Light Today with Tomorrow” demo event held June 28 at the Xerox Rochester International Jazz Festival. Leading up to the main event, the 10 finalist companies participated in a six-month accelerator program at NextCorp’s incubator space in downtown Rochester and each received $100,000 for advancing to the finals. Luminate NY, an optics, photonics and imaging accelerator program, is funded by Empire State Development’s Finger Lakes Forward initiative and administered by NextCorps. Positive Science, founded in 2006 by RIT alumnus Jason Babcock ’03, ’00 (color science, imaging and photographic technology), is a head-mounted eye-tracking and behavioral analysis system that can be used by clients for a variety of projects. Hardware systems are customizable to allow researchers to explore applications in all areas of eye tracking; software provides an eye-tracking solution for the Mac OS platform that uses intuitive calibration and custom graphics. The company also provides post-capture reviews and comprehensive training. To date, Positive Science products have been used by several clients including RIT, New York University, University of Rochester, Duke University and Nottingham University-Malaysia Campus, among others. Positive Science joined Venture Creations in 2016, and its data analysis technology is based in part on RIT's patented intellectual property licensed from RIT's Technology Transfer Office. Molecular Glasses, founded by Mike Molaire, focuses on technology that converts materials to noncrystallizable and soluble molecular glasses— without affecting their original photo physical properties—for stable and long-lived organic light-emitting diodes and other organic electronics. Company leadership—with more than 100 years of combined experience in materials innovation—has developed OLEDIQ, a revolutionary new class of organic semiconductors capable of reducing power consumption in mobile applications, providing higher display resolution and reducing costs by enabling lower-cost manufacturing processes. Since opening in 2003, RIT’s Venture Creations has graduated 38 companies, of which 12 have been clean-energy companies. Collectively, these companies have created 521 jobs and raised more than $70 million in private capital.